This is a “Go To” recipe of ours that we use on week nights when we don’t have much time and want something tasty for dinner. We use Turkey Italian Sausage because it’s low in fat and cholesterol. You could substitute a low fat regular Italian Sausage if you like. 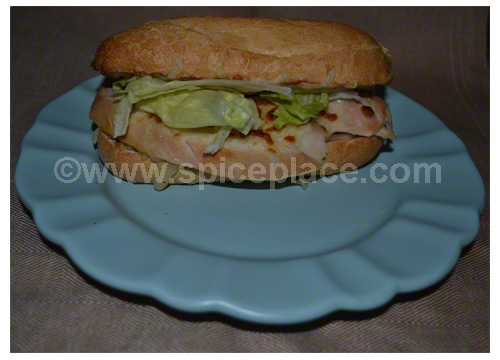 Submarine Sandwich Rolls (some call these Hoagie Rolls). Cook 2 Italian Sausages for each sandwich you will be making. Slice each sausage in half length-wise. 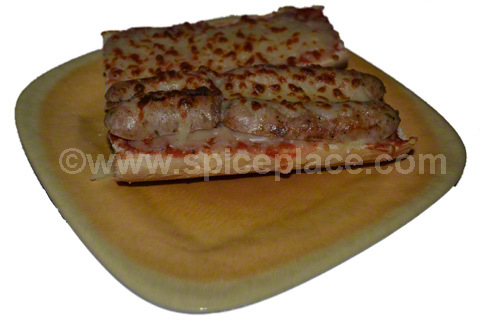 Spread the Spatini Tomato Sauce mix over both tops and bottoms of the hoagie roll. Add 3 or 4 halves of the cooked Italian Sausage. Top both sides of the Hoagie roll with shredded Mozzarella cheese. Broil until the cheese is melted and a little browned (caramelized). Serve hot with baked French fries or cole slaw. 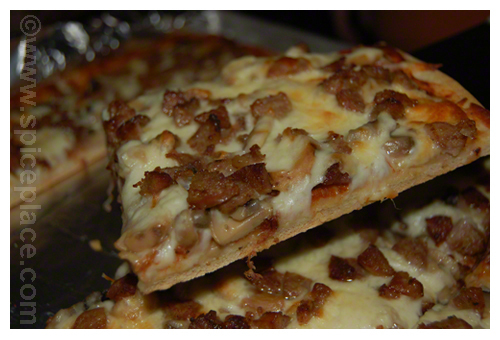 You have to have a ready to go pizza crust for this recipe. Make your own or use a store bought one. Meat topping, if desired. Shown with low fat Kirby and Holloway Sausage. Mix the Spatini Seasoning, Italian Seasoning, tomato sauce and sugar together. 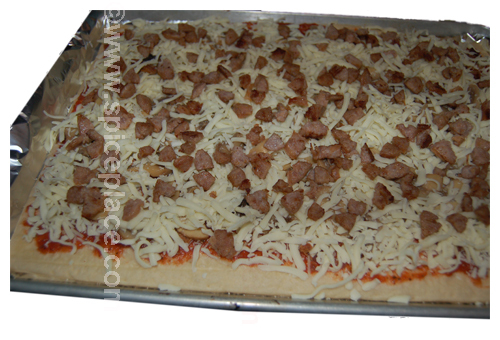 Spread the seasoned tomato sauce over the prepared pizza crust. Top with Mozzarella Cheese. Top with Parmesan Cheese. Bake at 400° F for 15 to 20 minutes, until cheese is melted and bubbly. Let cool for a few minutes, then slice and serve. 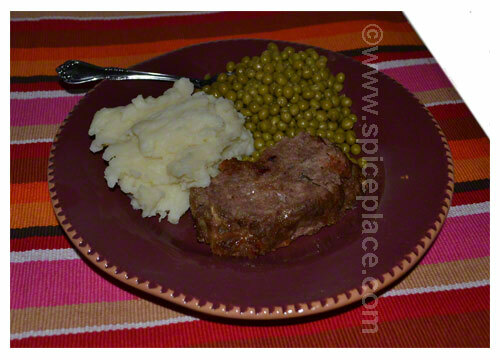 Sumptuous Meatloaf seasoned with Spatini Seasoning Mix. Shape into a loaf, place on a cookie sheet covered with a piece of non-stick aluminum foil. Bake in a 350° F oven for 1 hour. Serve with mashed potatoes, and a vegetable. 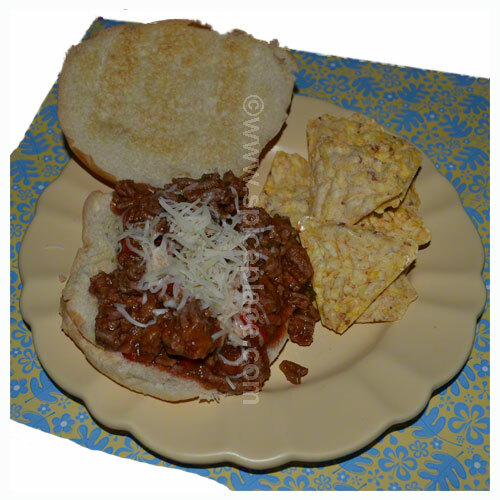 Spatini Seasoning adds a new taste to this recipe for the classic Sloppy Joe. Brown the ground beef in a lightly oiled non-stick skillet, turning often and breaking up any clumps. Sop up any grease in pan with a paper towel. Add green onions, and red bell pepper. Cook, stirring often, until onions are clear. Add tomato sauce, Spatini and sugar, stri well and cook for 5 to 10 minutes, stirring often. Toast your favor bun or bread. Using a slotted spoon, place about 1/3 cup of Sloppy Joe mix on bun and top with Provolone/Mozzarella Cheese and a pinch of Parmesan Cheese. Start to finish in less than 5 minutes. We use Gilroy Farms Minced Garlic in this recipe because we find it has better flavor the chopped fresh garlic, it’s creaminess makes it easy to spread, and there’s no peeling and chopping required. Melt 2 tbsp butter in a coffee cup by microwaving on high for about 15 – 20 seconds. Add 1 to 2 tsp of Gilroy Farms Minced Garlic. Stir well. Let sit for 1 to 2 minutes. Toast Italian Bread slices in your toaster. 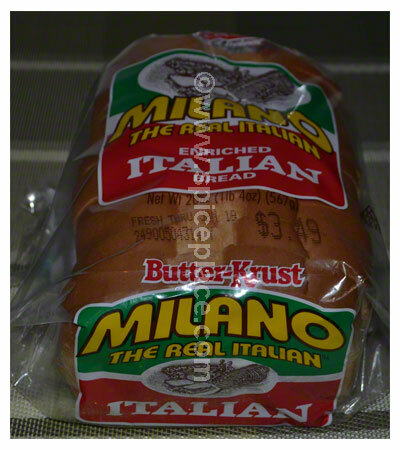 (Holsum Milano Italian Loaf bread in the bread aisle of your grocer works well). Spread garlic butter mixture over the toasted bread with a knife or brush. 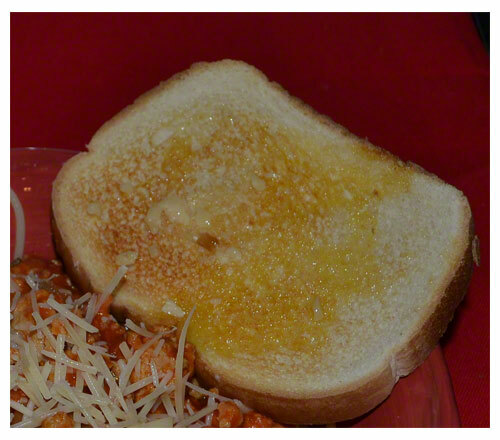 Butter/Garlic Mix is enough for 4 or more slices of Garlic Bread. Add some Parmesan cheese for extra flavor. Delicious and healthier for you than a Spatini Meat Sauce Spaghetti made with ground beef, this recipe is ready to eat in 20 minutes. We use Gilroy Farms minced garlic because it’s creamy smooth, has a strong garlic flavor and saves time. Add chopped onion to a lightly oiled 3 quart non-stick sauce pan. Cook onions stirring frequently until onions become translucent. Meanwhile, begin cooking your favorite pasta according to package directions. Add chopped garlic, and continue cooking until onions begin to brown. Be careful to not burn the garlic. Chop up the chicken well (otherwise the meat will stick together and become hard to separate). Add can of chopped mushrooms, cook for 1 to 2 minutes. Add the chicken to the pan, and cook well, stirring often, about 5 to 10 minutes. Sprinkle the Spatini over top of the meat mixture. Pour in the tomato sauce and water. Stir well. Cook for 5 minutes, stirring often. 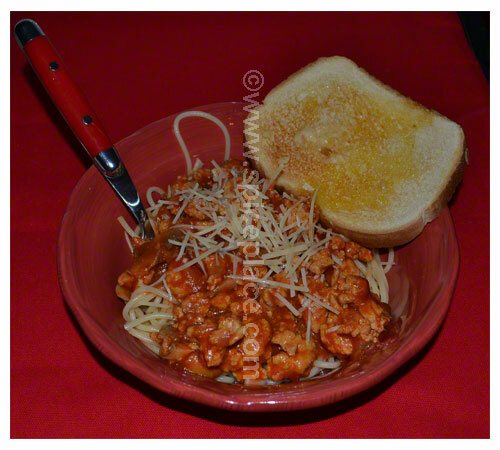 Serve over your favorite pasta along with quick and easy garlic bread. Makes 4 or more servings depending on serving size. 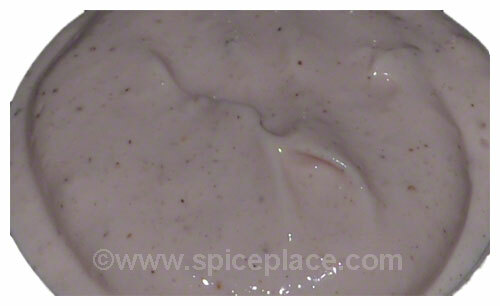 In a small bowl (or use the sour cream cup itself missing a tablespoon or so of sour cream), mix 2 tbsp + 2 tsp of Spatini Seasoning Mix with 1 pint (16 oz) low fat (light) sour cream. Cover and Chill in refrigerator for at least 1 hour. 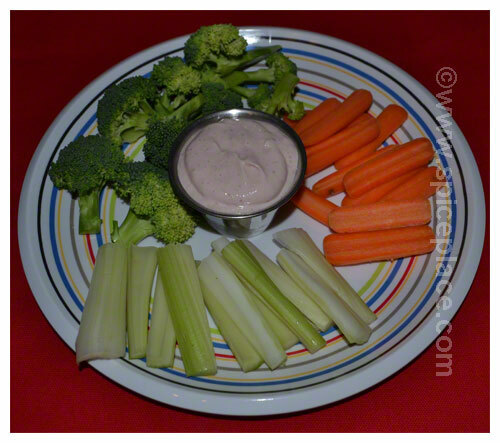 Stir and serve with chips, crackers or veggies. This website is all about Spatini Seasoning. While the package of Spatini has recipes for making Italian Style Spaghetti Sauces we know Spatini is used in many, many more recipes. We’re looking for recipes using Spatini and build a collection of all of the uses of Spatini. We will make every recipe submitted, take pictures of the prepared dish, and write about them here on SpatiniSeasoning.com. Please share your favorite uses of Spatini in the comments at the bottom of this page. Thanks in advance for sharing your recipes. In a medium saucepan, combine 1 envelope (2 tbsp + 2 tsp) Spatini Seasoning Mix, 1 tbsp oil (optional), desired tomatoes and water from tables below. Bring to a boil, then simmer, stirring frequently, as directed below. Makes 1 pint of Spatini Spaghetti Sauce (Four 1/2 cup servings).